AACG Welcomes You To The 7th Annual Economic Summit. This year's theme is expanding your business on a global scale. Learn skills to expand your business regionally and globally. Business exhibits open at 10:30 a.m. The main conference is from 11:00 a.m. – 4:15 p.m., followed by a business networking reception from 4:15 p.m. - 6:00 p.m. The purpose of the Summit is to educate entrepreneurs on the government and corporate level programs benefitting minority-owned businesses. This is an inclusive event, marketed to all members of the local business community including Asian-Americans, women, veterans, service-disabled, LGBT, and other communities. 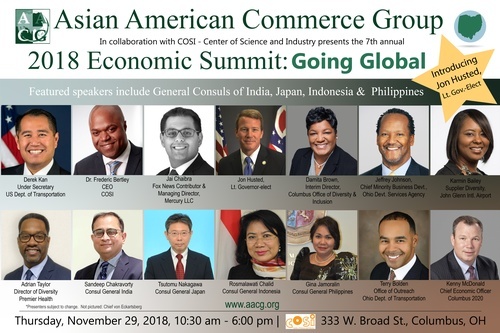 AACG recently obtained its 501c3 status with a mission that states: the Asian American Commerce Group fosters the advancement and creation of synergy among the Asian American business community and its supporters through business networking, education, and inclusion. 1:00 Supplier Diversity Leadership Panel - Learn of Opportunities for Minority and Female Owned Businesses from Central Ohio's largest procurers of services. Resources Leadership Panel - Learn resources to grow your business globally. Network Reception With Newly Elected Officials. Meet Your Newly Elected State and Local Officials.